The Phillies lost by 20 runs. It’s only the third time they’ve lost by 20 runs or more (Interestingly, all three of these games were parts of double headers). The last time they lost by 20 or more was July 6, 1929. It was against the Cardinals, and the score was 28-6. It was the most runs ever scored by the Mets. To put that in perspective, the Mets have played 9,058 games. That’s a lot of games behind this one. It was the most runs the Phillies have given up since that July 6, 1929 game against the Cardinals. The Phillies gave up 24+ runs three times in the 1920s, and didn’t repeat that feat until this game. The Phillies gave up 11 unearned runs in the loss. It’s only the fourth time since 1990 ANY team has given up that many unearned runs. The last time the Phillies gave up that many? According to Baseball Reference, it was August 25, 1922 (during an era when unearned runs were given out like candy). Roman Quinn and Scott Kingery combined for 3 innings pitched. It’s the most innings pitched by position players in a Phillies game since August 31, 1956, when Harvey Haddix (yes, that Harvey Haddix) injured his back while warming up (thank you, baseball reference and Google). That injury forced future Phillies Wall of Famer Granny Hamner into pitching duties. Hamner managed to get through 4.1 innings. Fun fact(? ): Hamner’s ERA+ was better than his OPS+ in 1956. Scott Kingery’s pitches were so slow that they didn’t even register on the radar gun. Pitches might be charitable – they could more accurately be described as “lobs in the general direction of the plate”. According to MLB Network Radio, he barely cracked 38 MPH. Given Roman Quinn’s extensive injury history, the decision to let him throw 42 pitches was dangerous. Quinn and Kingery weren’t GOOD pitchers, but since they came in when the game was all but over, they had very little impact on the outcome of the game. Fangraphs gives them a total of .000 WPA for their pitching efforts – they neither helped nor hurt the Phillies odds of winning. Offensively, Kingery had 0 PA and Quinn was 2 for 2, which actually gave him a .001 WPA offensively. So the two players who combined to allow 9 runs technically helped the team’s odds of winning overall. Despite all of this, they still gained a half a game on the Braves that day – the Phillies won the second game, and the Braves lost their only game that day. Baseball is amazing. Standout Hitter: Roman Quinn. The speedster has looked great in his first 50 PA, and especially so this past week. 2 stolen bases, an 1.150 OPS, and good defense – it’s still early, but the early signs are encouraging. Something to keep an eye on – he has 4 SB in 50 PA. The team leader (Cesar Hernandez) has 16 SB. Will Quinn lead the team at the end of the season? Standout Pitcher: Hector Neris. I… can’t believe it. After his awful start I thought he had Jeanmar Gomez’d, but I can’t ignore the week that he had. 4 innings pitched, 8 strikeouts, 1 walk, 2 hits. His ERA was as low as possible (0.00). His peripherals suggested that he was even better (-0.09 FIP). If this Neris is back, the bullpen just got a lot stronger. Sit-Down Hitter: Odubel Herrera. More like “Nodubel”. Odubel had an ugly week – his OPS more closely resembled an okay OBP (.321). Combine his offensive ineptitude and Quinn’s opposite-of-ineptitude, and you can see why fans are clamoring for Quinn over Odubel. It’s important to look at the bigger picture – Odubel has an established track record of success (Quinn doesn’t, at least not yet), and Odubel’s plate discipline hasn’t exactly deteriorated. It was a bad week driven by an unlucky BABIP (.167). Don’t let recency bias take charge and cause you to overreact. Sit-Down Pitcher: Ranger Suarez. He was the starting pitcher in the 24-4 loss against the Mets. Do I need to say any more? This first pitch by Sister Mary Jo is second to nun. Big Al is the hero we need. Walk offs are cool, but balk offs are better. This offseason, the two marquee free agent pitchers were Jake Arrieta and Yu Darvish. The Cubs chose Darvish over Arrieta, and the move hasn’t worked out for them – he had a 4.95 ERA in 40 IP before being shut down for the season. 5 more years, Cubs fans. He can turn it around. Jose Altuve respects the grind. 9 years ago today Eric Bruntlett did a thing. 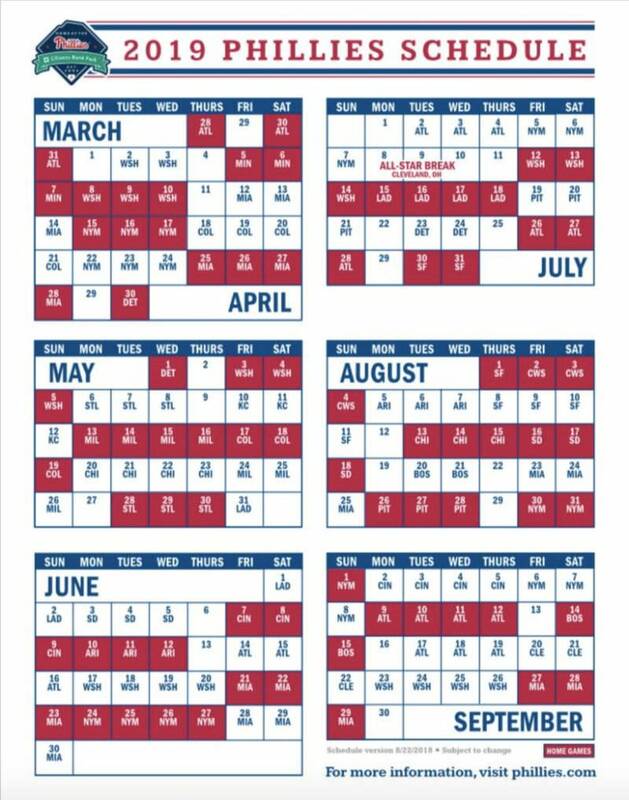 The Phillies 2019 schedule has been released. Start planning now to support the team as they look to defend their World Series championship.